M1 8, M1 12, M1 20, M1.5 10, M1.5 16, M1.5 25, M2 10, M2 20, M2 30, M2.5 12, M2.5 20, M2.5 30, M3 12, M3 20, M3 30. This split-cotter pins kit is a practical hardware for fastener which can prevent the nut from turning against the bolt. Includes 5 kinds of split-cotter pins, 35pcs for each kind, 175pcs in total. This split-cotter pins kit is a practical hardware for fastener which can prevent the nut from turning against the bolt. A practical industrial fastening hardware. Content:8pcs 5/32" x 2-5/16",20pcs 9/64" x 1-3/4",25pcs 7/64" x 1-5/8",25pcs 5/64" x 1-9/16",30pcs 5/64" x 1-5/16",42pcs 3/32" x 1-3/16". · Popular sized hair pins fit a variety of applications. United States. 3/32" x 1-3/16". Virgin Islands, etc. htm for details. U.S. territories such as Guam, Puerto Rico. This includes. 9/64" x 1-15/16". Made By GOLIATH INDUSTRIAL TOOL. Stainless Steel Pins Won't Rust Or Corrode. 150pcs 3/32" X 1". 30pcs 5/32" X 2-1/2". 50pcs 1/8" X 2". Galvanized Steel Keys Resist Corrosion This kit includes the more popular sizes of cotter pints which fit a variety of applications. Nail Guns & Nails. Paint & Spray Guns. Truck, Trailer & Accessories. This sale is for five (5) NOS 50 piece boxes ( 250 total) ZECO Zinc plated HAMMER LOCK COTTER PINS 1/4" X 1-1/4" LONG. The boxes are plain brown or blue no choice as picked at time of order. Brand new this lot is for a total of ten. 1/2 diameter 2-1/2 length. I'm sorry but I was offering this item as free shipping but I can't send it for cheaper than like 6.50 so that's why I am revising my listing. Generic BB051209B Lot Of 41 3/16"x2" Extended Prong Cotter Pin ! NOP ! CHAMPION FASTENERS SPLIT PINS MASTERKIT - 1540 PIECES. 1540 Pieces. Standard : DIN7. Qty : 50pcs. Length : 8mm. •It is a box of Split-Cotter Pins. •Material: Stainless Steel. •Quantity: 1 box(total 90 pieces). I send goods within 12 hours. Usually I will respond in 24 hours. •3x20mm(10pcs), 3x40mm(5pcs), 4x25mm(5pcs), 4x50mm(5cs), 5x30m(5pcs), 5x60mm(5pcs), 6x60mm(5pcs). Ideal for all your securing needs. 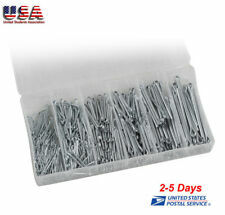 Box Contains 6 popular sizes SKU: 5-Pin-555PC. 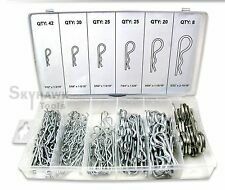 Hitch Pin R Clip Kit Zinc Plated Steel 80Pcs x 1Set. Material: Spring Steel 65 Mn. Plain Slotted Roll Spring Pin. LOWER 48 STATES ONLY! Made By GOLIATH INDUSTRIAL TOOL. Stainless Steel Pins Won't Rust And Corrode. 20pcs 3/16" x 3". 8pcs 5/16" x 2-1/2". 20pcs 1/4" x 2". Carbon Steel clevis pins. Virgin Islands, etc. htm for details. U.S. territories such as Guam, Puerto Rico. This includes. 7/16” dia x 2” pins. 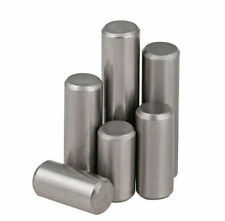 Popular Sized Pins Fit A Wide Variety Of Applications. 30pc 5/32" x 2-1/2". 50pc 1/8" x 2". 75pc 1/8" x 1-1/4". 100pc 3/32" x 1-1/2". SPRING ROLL PIN SLOTTED. 3/8" X 1" 420 STAINLESS STEEL. Standard : DIN7. Qty : 100pcs. Length : 6mm. Standard : DIN7. Qty : 100pcs. Length : 18mm. You get two full boxes and one partial for a total of 48 pieces. With sizes coming the following Item Number:3184-0. 1 x Storage Case. 5PC 3/8" x 2". 5PC 3/8" x 1-1/2". 5PC 3/8" x 3/4". 10PC 3/32" x 1-1/4". 10PC 3/32" x 1-3/4". M1.5 16mm x 5PCS. M1.5 6mm x 5PCS. M1.5 8mm x 5PCS. M1.5 10mm x 5PCS. M1.5 12mm x 5PCS. M1.5 14mm x 5PCS. Model: Spring Pins Split Tension Roll Pin. Material: Black Zinc-Plated Carbon Steel. 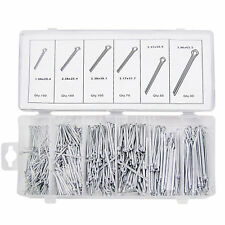 555PCS Iron galvanizing Split Cotter Pins Hardware Fasteners Parts Set 1/2" 1/4"